Before we get started, be aware that AWS really isn’t for everybody. The question is: is AWS right for you? Well, that depends. Looking for a specific topic? Check the Table of Contents! TL;DR: If you’re planning to launch a commercial website of any kind, the answer is yes. However, a certain comic book character once said: “With great power comes great responsibility”. When you host WordPress on AWS you get a lot of power and flexibility and a tremendous value, but you also take on a lot of responsibility normally shouldered by your web host – you are now your own (and only) IT person. You set up everything. You configure everything. You maintain everything. If something goes wrong, you are the one that has to fix it. You’re on your own. And if you are not comfortable with the idea of configuring or managing a Linux system via command line, you could very well find yourself in the Ninth Circle of Technological Hell. That said, the positives are the same as the negatives: you set up everything, you configure everything, and you maintain everything. You get exactly what you want, the transparency and flexibility available to you is limitless, the performance is spectacular, and best of all: the price is a value unmatched in all of hosting. Your basic AWS WordPress configuration will run you about $7/month… but it’s free for the first year to new users. To enjoy those benefits, you just need to be able to handle the complexity of setting up and maintaining the server yourself. From scratch. Over a command line. Fortunately for you, that is what this primer is all about! If AWS sounds too overwhelming for you, but you need something better than shared hosting for your personal site, you could try a Dreamhost VPS instead. Just don’t try to use Dreamhost for commercial purposes… they aren’t very transparent about resource usage (especially CPU load and disk I/O), don’t offer static IP addresses at all, and VPS performance can suffer badly under a heavy load with no way to troubleshoot or fix it. AWS has a lot of proprietary lingo and concepts that can make it hard for new users to handle. So before we get to all the configuration, I want to familiarize you with some of the important terms. You don’t need to memorize this, but if you read it at least once, it will save you from a fair bit of confusion later. “Elastic Cloud Compute” – this is the AWS service that handles Amazon’s virtual servers. “Amazon Machine Image” – this is an image (like an ISO) that contains a configured server. You use these to launch new server instances. An “instance” is a virtual server; more specifically: a single instance of an AMI. You can customize an instance and save it as a custom AMI. When you “terminate” an instance, you are destroying/deleting it (like Arnold in the venerable horror/action movie). Only do this when you are completely sure that you want the server and all it’s data to disappear forever. When you “stop” an instance, you are simply powering it down, virtually. You can boot it back up at any time, data intact (minus anything in memory or “ephemeral storage” of course). “Elastic Block Storage” – this is the AWS service that handles data/file storage your instances… it’s where all your virtual hard drives, or “volumes”, are kept. Individual EBS volumes act like virtual hard drives. Each of your instance will likely have an EBS volume associated with it. A snapshot is a static backup of a volume. They can belong either to a custom AMI you’ve saved or an EBS volume. This is Amazon’s DNS service. Each domain you configure (which are called “hosted zones”). This is Amazon’s monitoring service. You can use this to track resource usage and/or be notified of server trouble or downtime. This is Amazon’s term for a static IP address. Any elastic IP you control can be reassigned on a whim, hence “elastic”. This is essentially the firewall configuration for your server. They can be used to restrict access by port, ip address, protocol, etc. There are plenty of other things on AWS for you to feel overwhelmed by if you stray off the beaten path (like load balancing and spot instances), but I don’t want you worrying about those right now because if you’re reading this… you don’t need them. One thing to keep in mind at all times is cost. AWS charges for every. little. thing. you. use. This means that if you are careful, you can keep your costs down… and if you are really negligent, you can literally bankrupt yourself. I’ll explain some of the most critical considerations before we move on. Amazon offers a wide variety of AMI’s for you to choose from when creating your own instances. Some (such as Windows servers) have additional costs due to licensing. For this tutorial we will be using Amazon Linux (which is a custom version Red Hat Enterprise Linux 5/6 ), which has no additional costs. When you create your instance, you will be able to choose which datacenter to use (you select from a list of geographic locations) and also an instance type and size (AMI’s follow a type.size naming convention). You pay for your instances by the hour – and the rate is slightly different for each datacenter. For this tutorial, I highly recommend you select a t2.micro instance – which is not only very inexpensive, but free for the first year to new users. The “t2” instance type is a “general purpose” instance type. Be careful though, Amazon still offers previous-generation “t1” instances, which are more expensive and less performance. Unlike other services, Amazon doesn’t charge at all for a static IP address if it is attached to a running instance. There are two ways you will end up with a snapshot – either by saving a custom AMI (which automatically creates a snapshot) or by manually creating a snapshot of one of your EBS volumes (which is how you would backup your server). In either case, each snapshot will cost you about 11¢ GB/month, as of the time of this writing. DNS will cost you 50¢/month per “hosted zone” (e.g. per domain) plus a few cents per one million hits. Unless you run a very popular site, you can estimate this to be about 51¢ per month. There are some other potential costs to be aware of… EBS storage is free below a certain usage level, but incurs costs if you go above that. This shouldn’t happen in most typical WordPress use-cases. There are also data transfer costs, which should be near-zero (we’re talking cents) unless you are running some sort of download service (such as a WooCommerce site with digital products)… but if you are, you really should consider S3 as an alternative. Before we can do anything else, we have to provision (create and start) your instance. To start provisioning your instance, log into your AWS console and select “EC2” from the list of AWS services to get to your “EC2 Dashboard”. 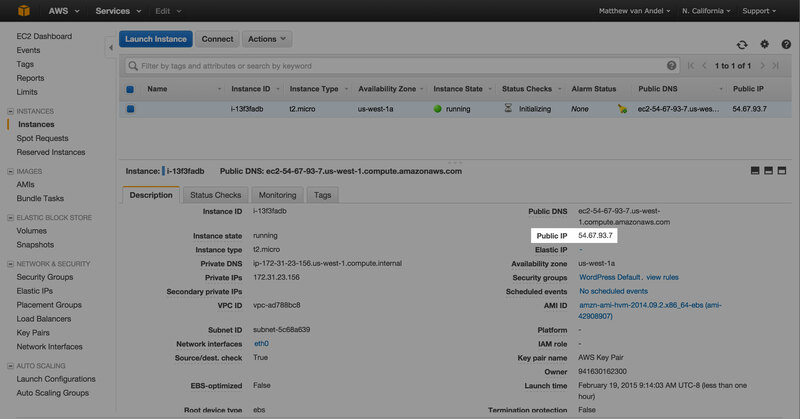 On your EC2 Dashboard click the big, blue “Launch Instance” button in the middle of the page. Alternatively, you can select “Instances” (in the menu on the left) and then “Launch Instance”. Before you get any further, make sure you are operating in region (i.e. data center) that you want. You can’t change this later, so decide now. You can change your region in the upper right of the screen. For this tutorial, we want to use Amazon Linux (64bit) as our AMI. Find the “Amazon Linux” (also, make sure it’s 64 bit by looking under the “Select” button on the right) and click “Select” to continue. Amazon Linux is a custom RHEL 5/6 (Red Hat Enterprise Linux) compatible Linux distribution. Select the t2.micro instance. “t2” is Amazon’s general purpose instance type, while “micro” is a general indication of that instance’s resources (in this case, very low CPU and memory allocation). You don’t need to change most of these settings, as the defaults should be perfectly fine for now. That said, the two settings I want to draw your attention to are Enable termination protection and Monitoring. For WordPress sites, I highly recommend checking the Enable termination protection option. If you ever want to delete your instance, it will add a couple steps, but it will also protect you from accidentally selecting “Terminate” at some point when you really mean “Stop”. If you check the box next to Monitoring, you are opting into AWS’s “detailed” CloudWatch monitoring service, which costs $3.50/instance/month. All instances include basic CloudWatch monitoring for free… which checks your server every 15 minutes for things like CPU usage, disk I/O, downtime, etc. When you enable detailed monitoring, these checks occur as frequently as every minute (which is really useful when paired with a status check / downtime alert). Next, you need pick some storage options for your EBS volume. You really just have two important decisions to make here… how much space do you need, and what kind of storage device (volume type) do you want? Remember, you pay for everything on AWS. When it comes to storage, Amazon tracks storage size (in Gigabytes) and IOPS (input-output operations per second). To stay in the “free tier” you just have to stay under 30GB. Set this for 8, which is more than enough for now. Size must also be larger than the default size of your selected AMI. In most cases, this is 8GB – so I don’t recommend reducing it. This keeps your data on very fast solid-state drives, which generally provides great performance. The tradeoff is that you are at the mercy of the system’s IOPS limits. In the screenshot above, we are guaranteed a baseline of 24 IOPS (this is based on the storage size we’ve entered), with bursts up to 3,000 IOPS to deal with sudden, temporary spikes. This is ideal for most small WordPress sites, but be aware that poorly configured caching plugins or PHP extensions can wreak havoc on your IOPS limits and run your server into the ground. This keeps your data on the same solid-state drives as above, but you specify exactly how many IOPS you need. Keep in mind that this comes at a higher cost ( 6.5¢ per IOPS / month PLUS 12.5¢ per GB / month ). This keeps your data on old-fashioned magnetic hard drives. These give you about 100 IOPS on average (sustained!) but you lose the extreme bursting capabilities of General Purpose (SSD). AWS tags are used in a number of cloud computing scenarios, but they won’t do anything at all for you, Mister or Missus WordPress aficionado. Skip this page and just click “Next”. The last step in launching a new server instance is configuring your Security Group (basically, your virtual firewall). You will have more options later, but right now this page is only concerned with inbound traffic allowances. We need to set up two rules right now. Under Source, select “My IP” from the dropdown. This will allow you to access your instance over SSH from only your current IP address (highly recommended for security reasons)… Remember, we still have a lot of configuration to do once this instance is launched! Click “Add Rule” on the lower left. This allows visitors to access your website over HTTP from any address. If you don’t include this rule, your website will be inaccessible. When you’re finished, click the blue “Review and Launch” button… we’re almost there! If you need SSL on your site, you also have to add a rule for HTTPS… but don’t do it unless you are going to add and configure SSL right away, otherwise your secure addresses won’t work (we won’t cover that in this primer – configuring SSL is a fair bit of extra configuration). We’re almost there… you have one last chance to review all your settings before you launch. If you’ve been following this tutorial, you should be just fine. Find that blue “Launch” button in the lower-right and click it! Don’t worry, this is the last step: you now need to create an authentication key pair that will allow you SSH access to your server. DO NOT SKIP THIS. An unprotected server is a dangerously vulnerable server. AWS makes it easy. Simply open the first dropdown and select “Create a new key pair”. Give your key pair a friendly name like “AWS WordPress” and then click “Download Key Pair” to get your private key (which will let you access your instance over SSH). You will need to save this private key somewhere safe. On OSX, the correct location is ~/.ssh (you will also need to restrict permissions to 700) – on Windows or Linux it’s… I’m not really sure. Sorry. When you’re ready, click “Launch Instances”! It will take a minute for your instance to launch. Click “View Instances” to go back to your dashboard. Stay on this page, you’ll need information from it in a minute. With all that out of the way, we’re finally ready to set up our own WordPress-friendly LAMP stack on AWS EC2. In addition to this guide, you can find Amazon’s official documentation on this here. Keep in mind, however, that this guide differs from that one in a few key areas. The default guide will install outdated versions of Apache, PHP, and MySQL – which is just not okay with me. To install newer versions, we have to specify the exact version numbers for each package we want in every command. I’m sure you’ll see what I mean in a moment. Before you can get access to your new server instance, you still need to do a couple things: ensure you have access to an SSH client and set permissions on your private key file to 400, 600, or 700 (it shouldn’t be accessible to anyone else or you won’t be able to connect using it). If you are on OSX, then Terminal is built-in to the operating system, and you are good to go. If you are on Linux, you just open a command prompt. If you are on Windows, you will need some SSH software like PuTTY. Now we need to secure the private key, or we won’t be able to use it to connect. The commands below cover OSX, but Linux users should be able to easily tweak this. Windows doesn’t use Unix style permissions, so unfortunately you’re on your own there. First, do you remember your key name? It ended with .pem. You’re going to need it. If prompted, enter your OSX password. On OSX, grab yourself a copy of SequelPro – it’s free! On Linux or Windows, use MySQL Workbench – also free! MySQL Workbench is available for all platforms. To download without signing up, look for a low-key “No thanks” option on the login page after you select your download. Open up Terminal or your equivalent command prompt… it’s time to get down and dirty with all that exciting server configuration over SSH! Let’s break this down… you are connecting via ssh, you are using the -i modifier to specify a specific private key, and you are logging in using your username “@” your ip address. By default, when logging in to your instance via SSH, you will always do so as ec2-user! This username is automatically configured for you when you create your instance. Make a note of the timezone code (e.g. America/Los_Angeles). Finally, run a command to create a symlink to your timezone information (be sure to replace YOUR_TIMEZONE below with your own timezone code)! Just because your server is new doesn’t mean you won’t need some updates. Before we do anything else, let’s make sure everything is up-to-date. You may be asked to confirm a download. If so, type y to accept and hit enter. Then you just have to wait for the updates to finish. Next, we need to install all of your web server packages: Apache, Php, MySQL, ImageMagick, etc. I won’t waste your time explaining what each of these are, they’re mostly self-explanatory-ish – you can Google the more mysterious ones if you are so inclined. Run the following commands, in-order. When available, WordPress uses ImageMagick to improve it’s image manipulation capabilities. That’s why we’re including it in our stack. Next, we need to ensure that ImageMagick is loaded with PHP. This involves manually editing the php.ini file. Hit Ctrl + X to exit the Nano editor, and be sure to save when it asks you. Before we go any further, let’s make sure that Apache is running and accessible in a web browser. Now, type your instance’s ip address into your web browser followed by /phpinfo.php – if you see a phpinfo page, you’re golden! If you don’t see the phpinfo page in your browser, you screwed up somewhere and you might want to start over. You don’t want to leave phpinfo.php file lying around because it gives away lots of sensitive and dangerous information about your server! Be sure you carefully read and follow the directions that the installer presents in your command line client. See the line in there for AllowOverride None? Simply change it to AllowOverride All. There are multiple places where “AllowOverride” is listed. Double check that you are changing the correct one. We want to change the /var/www/html directory only! As with Nano before, press Ctrl+X to exit, and follow the directions to save the file. If you want to host multiple websites on a single instance, now would be a good time to set up your vhosts (or virtual hosts), which enable this. Congratulations, your server is fully configured! Now, we just need to connect to connect to it with our database software and install WordPress. We need to do two things right now… connect to the MySQL server and create a new database for our WordPress install. This part of the tutorial is client software agnostic, but I’m a huge fan of Sequel Pro for OSX, which is what I use on a day-to-day basis. If you’re on Windows or Linux, you’ll want to use MySQL Workbench instead. What we will not be using it PhpMyAdmin, which is awful. Start by creating a new connection in your database client. For your connection method, you want to select the “SSH” option. For your SSH hostname, enter your instances public ip address. For SSH user, enter ec2-user (remember, that is always your default user). For authentication, you will need to point your client to the private key you downloaded earlier (this is the file that ends in .pem). Your MySQL username should be root. With that done, you should now be able to connect to your MySQL server! Go ahead, try it. Now that we’re connected, go ahead and create a new database/schema so that we can install WordPress. You can name the database whatever you like (I like to prefix mine with wp_ to let me know it’s a WordPress schema), but your encoding should be utf8 and collation should be utf8_general_ci. Next, we’ll want to create a new MySQL user whose access is limited to only the database you just created, and with limited privileges. Why? Because, if anyone malicious were to gain access to your site’s file system, you wouldn’t want your root password readily visible in your wp-config.php file. This is best-practices stuff. You are free to skip this step and move on with your root login, but I really don’t recommend it. The process is different depending on your client. In SequelPro, you will find the user options under Database > User Accounts. In MySQL Workbench, you’ll find this in the toolbar on the left under “Users and Privileges”. And don’t forget to save that password someone safe, like an encrypted password locker (1Password or LastPass are good choices). I recommend using only extra-long (30+ character) machine-generated passwords. Best security practices dictate that each database you create has it’s own user with these restrictions in place. This way, if someone gains access to a single MySQL account, their ability to do damage is limited to just that one database. At this point, you have two options… you can copy WordPress onto your server via SFTP or you can deploy it via command line. Your site files should be uploaded to /var/www/html – so start uploading and knock yourself out! If you have trouble uploading via STFP, you may need to fix permissions on the html directory. Jump down to the Fix WordPress Permissions topic and follow the first set of directions. Finally, visit your public ip address in your browser to complete that famoud 5-minute WordPress install! Don’t forget to use that special MySQL user we set up, when you do. After that, you’re done. Mazel tov! You are now running a WordPress AWS website on EC2! This is SUCH a great tutorial! I have this page bookmarked and I refer to it every time I’m setting up a site on AWS/Wordpress. Just wanted to say thanks! Hi, I have followed the tutorial (both this and multisite), and everything works great, except the files permissions… I can already see the files as owned by ec2-user and the group is apache, but still I can’t do anything without wordpress asking for a ftp user and password.